Catholic social services are gearing up for the arrival of six more intakes of former refugees to Wellington during 2017. Through our partnership with Red Cross and the Anglican Diocese of Wellington, last year 115 volunteer teams from our communities stocked and prepared 89 homes for 311 former refugees. 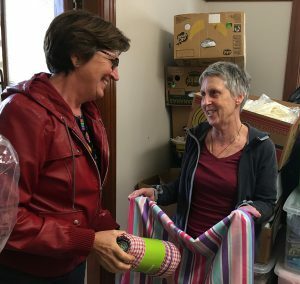 Parish groups can volunteer to provide a household pack, which includes items like linen and kitchen equipment, or provide a pantry pack. Due to storage space limits items are delivered in the week former refugees arrive. The first intake for 2017 will be in late February early March. One of the highlights of the Catholic and Anglican initiative, which began in February last year, has been to see the joy of parish groups being given a practical and straightforward way to welcome new New Zealanders. News in late 2015 about the difficulties Syrian refugees were experiencing, especially stories about deaths of children crossing to Europe, resulted in an outpouring of concern both locally and internationally. The need continues to be just as great. The last two years have seen the greatest movement of displaced people since World War II, as well as the immense movement of Syrian refugees in Europe, which have made the news headlines. We’ve supported families arriving in Wellington from Syria, but also from some of the forgotten emergencies of the world, such as Myanmar, Iraq, Afghanistan, Sri Lanka, Palestine and Colombia. If you can contribute to stocking and preparing homes for former refugees in 2017 please to contact CSS on email refugees@wn-catholicsocialservices.org.nz or phone (04) 385-8642.